I am excited to join with Island Batik and Kennel Quilts for this challenge! This is a charity I would never had heard of if I wasn't an Island Batik Ambassador, so I am glad to share it with all my readers. This is a great way to do something good for our furry friends and a super way to use up bits and pieces left after completing a project. Since I found out you can ship 8 in a flat rate bubble envelope I made 8. After all, you might as well get the most for your money, right? My donation is going to a local group that brings in animals from kill shelters in California and places them in local shelters so they can find a forever home! It's called Rescue Express and they are in the process of replacing all their beds, mats, blankets and towels with more consistently sized bedding to make the pets more comfortable and the laundering and sorting easier. This size will fit their extra small carriers! I happened to see Rescue Express on a news article and thought that it would be the perfect place for me to donate to, and I am glad I contacted them. I plan on sharing their information with my local quild and at Threads That Bind. These are great little projects to use up the leftovers from projects, I've even pieced the batting that goes inside. 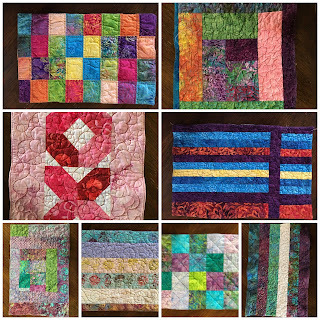 They would be great to make up ahead and keep on hand to try out different free motion quilting designs, or just as warm-up quilting before starting a larger quilt! 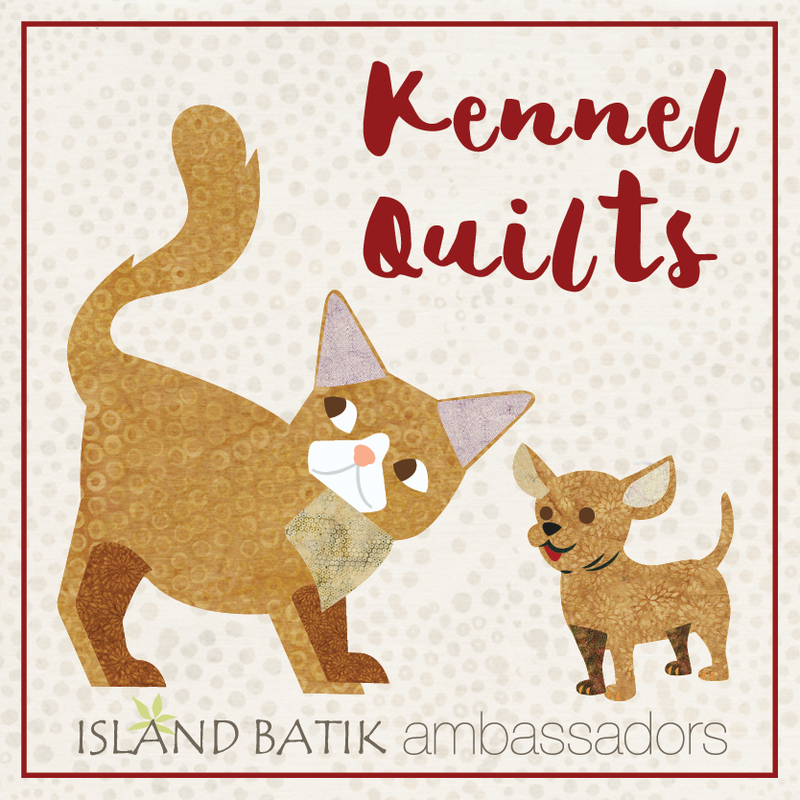 Kennel Quilts is a great organization - you can see more information here. It's a great way to help out by sharing something that we love to do - they always have current needs posted, or you can donate to a local shelter if you like! It doesn't take much fabric or time and it's a terrific way to put our quilting talents to good use. I started out with making the XO quilt - this was originally going to be for our Galentine's Day challenge, but it was a bit too large for a mug rug! I made a smaller version for that challenge, then thought this one would be perfect as a kennel quilt. I just added a border to make it big enough for a Kennel Quilt, and was really happy with it! Then I did some strip piecing using a set of leftover strips I had from my first Island Batik box and ended up with a couple of quilts using those. I did a couple more, just sewing strips of fabric together and trimming to size - these were super fast, and looked wonderful as well! Finally I pieced some log cabin style blocks using the last of the leftover strips. It was a fun way to use up all of those pieces that would normally be leftover from a project and they looked terrific as well! For the last one, I had pieces left from my last Project Quilting Challenge, so I sewed the strips together, then added pieces as needed to bring it up to size. You can see that you don't need to do anything fancy! Just some fun and simple sewing, then sew around the edges, turn right side out and topstitch. Do some quilting to hold it all together and you are done! (Do make sure you follow the guidelines so your little quilt is animal friendly) Yesterday I washed and attempted to dry - unfortunately my dryer has decided to stop heating, so I had to hang them to dry. I'll give them a bit of a press to straighten them out, then off they will go to cheer up some lonely pup or kitty! I make these and give to rescue groups at the pet stores during the weekends or pet adoption centers to give to people adopting pets. I used t-shirt knits left from my clothes sewing days and another quilter gifted me a large box of corduroy. I bought a couple of used mattress pads, cut everything into 20 inch squares, used my serger to sew them together, turned inside out and sewed 2 zig zag stitches to hold it all together. They wash up well, fit into carriers and make great gifts. Congrats on finding another worthy charity to donate to. You mats are adorable. They came out cute, and I love the idea of just using scraps. I've made 3 so far, and plan more.